Once again summer winds up delaying things. The perverbial list of honey-do's and unforeseen interruptions such as vacations seem to just get in the way sometimes. Since the last update I have been working on mounting the door latches, glass, steering column, and tachometer. The doors were removed a while ago to make them easier to work on. I highly recommend you do this if you can. Its a lot easier to set a door on a couple saw horses and fiddle with the small things like latches, handles, and window channel than trying to do it while the door is on the car. At least it was for me. One thing to do first before the doors are removed is to "pin" the doors. This will make re-mounting them a breeze. It took me a total of 1/2 hour to re-mount both doors (by myself) because I had the pins to align the hinges. All you need to do is drill a couple holes in each hinge and when you go to remount them you have predetermined location holes to align things. This not only works with doors but trunks, and hoods as well. Just a couple drill bits are all that's needed to align the hinge and door so when you install the bolts (in this case big Philips screws) things go back exactly where they were before you removed them. Trust me, this little trick saves a lot of time. When I had the doors removed the handles and latches were installed. This body came with bear claw latches installed from the factory and these work just fine. However, I needed to install some kind of actuator for the bear claws and whatever it is needs to be compatible with stock style exterior door handles. So, I did a little research and thanks to Project 33 I came up with these from Yogi's. They're spring loaded and have the square hole required for my repro Deuce exterior handles. So, I called Yogi's and ordered a set. Unfortunately they don't seem to carry them anymore and they sent me these. When it comes right down to it this style worked pretty well. It took a little fiddling and I found I needed to recess them about 1 1/2" to clear the door glass felt channel, but once that was accomplished they worked just fine. Because my glass body was designed for electric windows the doors are about a half inch thicker than stock Deuce doors. This meant that the handles had to have their square bars lengthened a bit. This was a simple procedure and was accomplished by cutting the bar and welding in a small piece to lengthen it enough to stick completely through the door. This lengthening is needed because the interior door handle will mount to this bar. Care was taken to lengthen the bar in an area that would not be in conflict with the latch actuators so binding would not be an issue. Here is the handle temporarily installed in the door. Permanent mounting won't happen till final paint, but the blind nuts have already been mounted inside the door so it only takes a minute to secure them in place. I do intend to switch them out for the locking variety but that will come later. With that job finished, I decided it was time to install the steering column. The column I have is a Flaming River unit and is polished aluminum. I bought it before I had decided on a "theme" for the car and since I didn't know exactly which way I was going to go I popped for the polished version. Unfortunately, the chance of someone having a polished steering column in his hot rod back in 1964 are slim to say the least, so I decided to go ahead and paint it body color. After painting this was a pretty straight forward installation. The only difference was in the way the tach was mounted. Many people just mount a tach on the steering column by using a large hose clamp. This is effective but for me a bit unsightly. I decided to drill the column trim and use blind nuts to bolt the tach mount to the column. This gives a little cleaner look. The tach I used is a Sun unit which matches the other gauges. So, with the tach mounted and wired the installation of the steering column is now completed. A bango style steering wheel will be installed later. The next project was door glass and the electric window mechanisms. I'll go into how the glass was cut later, for now lets talk about window channel. There are a couple ways to go here. You could go with a stock three piece channel or the universal "bendable" channel available from several different vendors. I chose the bendable style because this an inexpensive glass body and it does not have the specific mounting needed for the stock three piece setup. I like it when I don't have to make decisions and the designer of this body pretty much made this one for me. So, it was an easy job to glue the channel in place. I use a Loctite adhesive to do the job and it worked very well. However, you do need to wait about a week for it to reach its maximum holding capability. The doors came from the factory with what I believe are mid 80's Impala electric window units installed. To mount the glass these units had to be removed, the glass installed and then the units had to be reinstalled in order to mark the location of the glass channel (that glues to the bottom of the glass and bolts to the electric window mechanism). Then everything came out again and the channel was glued to the glass. (More on the glue later.) After 24 hours everything went back in and that job was finished. Here's a pic of the passenger's door with the glass and electric window mechanism installed. Now lets talk about cutting glass. Frankly there is no way I would tackle this job. Most people don't have the tools or the skills required to successfully cut auto glass and I am no exception. So I had my local glass shop do the honors. What I had to do was provide the patterns necessary for them to cut things to the correct size. Fortunately this body came with paper patterns for all the glass. Shown here is the windshield pattern. The paper patterns were transferred to Luann plywood and then test fit. Because this body has been sitting and curing for almost 15 years now, a little adjustment was necessary here and there for a proper fit. Not a big deal but you do need to be aware that fiberglass can shrink or warp slightly during the curing process and that some "tweaks" might be necessary. Here's the Luann windshield pattern finished. The back glass and door glass patterns were made the same way. This being a small town you would think having auto glass custom cut might be a problem. Not so... I dropped off the patterns on Thursday afternoon and my glass place called me Friday afternoon to come pick them up. Total cost including a tube of glass adhesive was a little under $160. Can't complain about that. Glass (windshields and back glass) in modern cars is glued in and actually becomes part of the structure of the car. 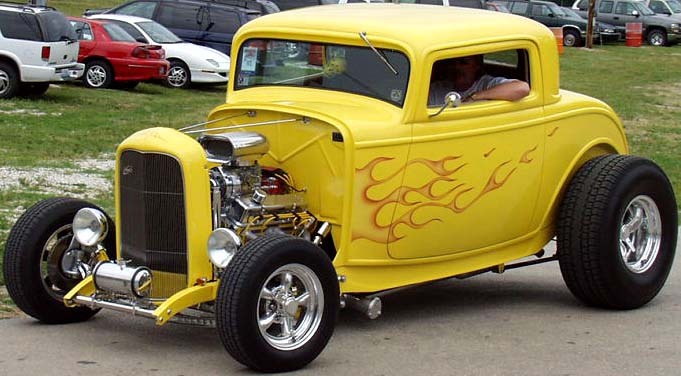 In 1932 Ford in their closed cars used a frame to mount the windshield that swings out to provide ventilation. In their 3 window coupes the back glass actually rolls up and down just as the door glass does. Now, some of the more expensive glass bodies will accept these stock designs without much modification, but the less expensive ones like mine generally do not. 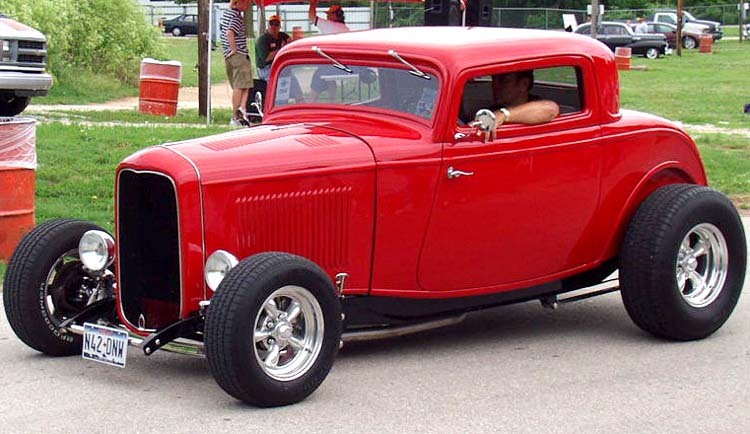 This body was designed to have the windshield mounted using a rubber channel similar to the way windshields were mounted through the 40's, 50's and 60's. The problem with this is that it doesn't look right and to me, it's like hanging out a big sign that says, "FIBERGLASS BODY". So, instead of using a rubber channel I decided to glue the windshield and back glass in and make a windshield frame that would appear just like the stock piece. 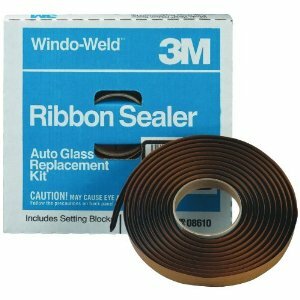 There are a couple ways you can glue automotive glass. One is a strip butyl adhesive that does a pretty good job. The second is a tube adhesive that comes in a couple different varieties. One requires a "primer" be applied to the glass first and the other does not. I chose, based on my glass place's recommendation, the primer-less stuff. In order to have the glass at the proper depth for a faux windshield frame I had to use both types of adhesive. The ribbon type had the thickness needed to position the glass in the correct place and the tube adhesive was used to completely seal everything in place. The result is a windshield that will need to be broken apart if it ever needs to be replaced, but one thing is for sure, it will never leak. OK, lets talk about windshield frames. Here is a picture of what I'm talking about. This car has the windshield glued in and does not use a frame. When compared to the car in the second picture you can see that when a car doesn't have a windshield frame of some kind it just looks totally wrong. Some people may say I'm nit picking but I don't think so. I know some "purists" will not like the idea of using anything faux on a deuce but quite frankly sometimes sacrifices have to me made in the name of economy, the amount of work involved. Here you can see the windshield frame and how it gives this car much more of a "stock" appearance. I actually had a few choices here. As mentioned earlier I could have purchased a reproduction frame, chopped it and made the necessary modifications to the body to accept the stock swing out mounts. However not only are reproduction frames expensive, the amount of work required for this body to accept a swing out frame would be prohibitive, and frankly I'm just not willing to spend the money or time it would take to do the job. There are faux frames available that glue to the outside of the windshield and they may look real to the casual observer, but anyone who knows deuces will easily be able to tell. These commercially available faux frames are also a bit expensive. In the neighborhood of $300. So the solution is of course to make my own. I figure I can do that for under $10. The first thing I needed to do was make another pattern. This one exactly fits the opening for the "stock" windshield frame which is larger than the opening for the glass... at least it is on this body. Next this pattern was transferred to some 18 ga. steel I had left over from another project. A cutoff wheel was used to cut out both the inside and outside shapes. Total width of a "stock" frame is about an inch. With a chopped windshield I feel I can get a better more proportioned look with a frame width of 7/8" rather and a full inch. Here is the base metal frame. Once the basic frame was cut body filler was used to build up a three dimensional, slightly curved outside surface similar to the original piece. One little detail that I added was the seam at the bottom corners. The stock frame is made in two pieces to allow the glass to be installed and when reproducing the "look" of a stock frame this is one detail that really needs to be there. This is lacking on the other faux frames you can buy and that one missing detail is the a dead give-a-way that its indeed a fake frame. Once completed it was primed and then test fitted. Can't get much better than this. With the frame finished I needed to paint behind it before installation. This is to ensure everything gets covered with color and it will make masking for final paint easier as well. So... everything was taped up and both the frame and the recess behind it were sprayed with color. Here is the finished product. Total time spent was about 6 hours, and the cost was next to nothing. Saved myself between $300 and $600 and in my opinion anyway, it looks better than any of the faux frames out there. True, its not "real", but it accomplishes the objective which is to make this glass body look as authentic as possible. It's getting there. Next I'll be wiring the electric windows, finishing up the throttle assembly, bleeding the brakes and clutch systems and doing some other minor stuff.